Winter garden blind is a kind of blind used in sloping areas such as roof. Especially pleat and duet blinds are among the preferred solution systems in these areas. However, due to their special carrier mechanism and systems, they are more costly than normal blind systems. Depending on the application area, motorized systems, skid and articulated systems can be used. Other blind options that can be used in these angled areas include wooden blinds, folding blinds and blinds. It cuts the ultraviolet rays coming from the sun outside the applied area and it is also used as a shade. A blind model working in the logic of blinds.Thanks to the special fabrics used, it contributes to insulation. motorized application is more accurate, it can also be supported with sensors. The system is guided by steel ropes at the edges and is prevented from running out of sight when working outside. One of the most important features that separates the Brisoley outer blinds from the shutter and the external blind is that it can be used half or full open.As it rests in the desired place, it can partially be exposed. this ensures that the space is not visible from the outside. When Brisoley is half open, it gives the feeling of watching outdoors with half-open eyes. Opening and collecting can be done with Arm (Plastic Coated Iron Rod). Motor and remote control can be added. Brisoley (external blinds)gives the building a decorative appearance. Ral can be painted according to color numbers. Can be adjusted according to light condition and angle. It has the ability to adjust according to wind conditions. Wind, light and other external factors are blocked when outside the building. Brisoley (outer blinds) consists of three main technical parts. Drun:The mechanism in which the mechanism group is collected. Pallet system: Strips (Lederbraid), attractive strips, side profiles of Brisoley (Outer Blinds) are the most important elements. Swivel system: Swivel arm. 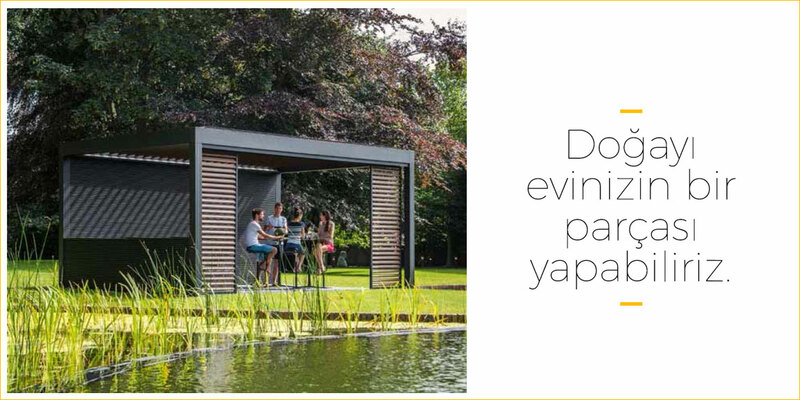 Günpay Blinds Systems offers its new product ProofScreen! This new vertical zippered Blinds offers you quality, smart design, durability and easy installation! With its patented, Plug & Play technology, fabric rolls can be easily removed and attached. ProofScreen is assembled and reserved inside the cable assembly unit. Wind ruptures, wind blowing or fraying fabrics remained old! ProofScreen Blinds systems are wind resistant, regardless of what angle! The new aluminum bottom covers provide extra stability and can be painted in the same colors as the profiles. Thus, you can choose colors that are compatible with the environment in your indoor or outdoor work! Thanks to the cable trunking on the side of the profile, the electrical connection cables can be easily mounted and concealed in such a way that they do not disturb the outside. It can be closed up to the base by means of the sealing strip. It can be used in all new or renewed buildings. It can be used in private properties or in places such as cafes, restaurants, hospitals, offices, shopping centers, schools. Suitable for all indoor and outdoor use. In the tests, it was found that it was resistant to the wind that is 80-120 km / h. Zipper works on the inner channel. Optimally compatible with fabric zipper. Easy setup ! The fabric roll box can be easily removed from the outside. Would you like to benefit from the free exploration and installation service?